“Lagusta Yearwood” is not a nom de chef referring to the joys of eating with gusto, French spiny lobsters (les langoustes), or the Spanish verb for “to like” – it’s the kind of name you get when your parents are hippies who met in the mud at the Woodstock Music Festival in 1969. It’s pronounced with a GUS in the middle, most emphatically not a GOO. Lagusta Yearwood is a restless rabble-rousing chef-turned-chocolatier who’s in love with deep flavor, ethical sourcing, farmers, the food poor people around the world have always eaten, lactic acid fermentation, and noodles. She lives in a little 1960s sunny ranch house in the tiny farm-focused town of New Paltz, NY with her sweetheart Jacob, and three cats: Sula, Noodle (told ya), and Cleo. Ms. Yearwood trained at the Natural Gourmet Institute in New York City and worked for many years with mentors at Bloodroot, a gourmet 35-year-old feminist-vegetarian restaurant and bookstore in Connecticut, and has done endless private cooking jobs around New York City and New Jersey. From 2002-2010 she ran a vegetarian meal delivery service bringing handcrafted meals featuring local produce to New Yorkers from Battery Park to Woodstock. 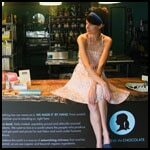 Since 2003 she has sold a line of gourmet vegan chocolates online at lagustasluscious.com. After years of cooking in dinky rented kitchens, she and Jacob renovated a former laundromat in downtown New Paltz to become a tiny little chocolate shop, which opened in June 2011. Caryn Hartglass: Okay, it’s time for the second part of It’s All About Food, here on August 27th, 2012. I’m Caryn Hartglass, thank you for tuning in. And now it’s going to get sweet – sweet mixed with a little defiance. How about that? I’m going to bring on Lagusta Yearwood. Caryn Hartglass: Hi Lagusta! I’m going to read your little bio first, if you don’t mind. Lagusta Yearwood: Oh, go for it! Caryn Hartglass: Okay. It sounds like you are a restless, rabble-rousing chef-turned-chocolatier who is in love with deep flavor, ethical sourcing, farmers, the food poor people around the world have always eaten, lactic acid fermentation, and noodles. She lives in a little 1960s sunny ranch-house in the tiny farm-focused town of New Paltz, New York with her sweetheart Jacob and three cats. After years of cooking in a rented kitchen, she and Jacob renovated a former laundromat in downtown New Paltz to become a tiny little chocolate shop, Lagusta’s Luscious, which you can find out more at lagustasluscious.com, which opened in June of 2011. Hello, and welcome! Lagusta Yearwood: Hello, how are you! Caryn Hartglass: Good, and how about you? Lagusta Yearwood: Good! It was interesting to hear your bio there, but there it is, and it was all true! Caryn Hartglass: Yes, all true! I told myself before I started the program a half and hour ago that I should grab a little chocolate before I started this, and I didn’t. And now I’m going to be in trouble. Okay. I’m just going to breathe deeply now. So…before we talk about chocolate, I just want to talk a little bit about how I met you, which was at the book reading for Defiant Daughters in Manhattan. I thought that your chapter in the book was my favorite. Lagusta Yearwood: Wow, thank you so much! Caryn Hartglass: What I liked about it was it was feisty and kind of positive. Whereas – and I’m not judging anyone else in this book; we all have our personal stories and some of them are quite heartbreaking, and anyone that can rise above anything difficult is amazing – but you have a great attitude. Lagusta Yearwood: Well, it’s easy when you’re around a mood-enhancer like chocolate all the time. Caryn Hartglass: I don’t know… I know that chocolate does not work long-term for some people. Lagusta Yearwood: And sometimes I definitely get sugar-induced stomachaches, that’s for sure. Caryn Hartglass: So I just wanted to mention Defiant Daughters, it’s by one of my favorite publishers, Lantern Books. We talked to Carol Adams and Jasmine Singer when the book came out, and now I’ve got you! It’s a great book. Lagusta Yearwood: Thank you. That’s a great compliment, I’m so honored. Caryn Hartglass: Great, let’s move on to chocolate! Caryn Hartglass: So, why chocolate? Lagusta Yearwood: Let’s see…I started off doing more savory cooking about thirteen years ago, which is when I graduated from culinary school. I started making truffles one year for our friends for the holidays…our friends really loved them, and I just started doing it more and more. Before I knew it, I had two full-time jobs – one had a little mailing list and I would ship out chocolates every month, and another was I was running a vegan delivery service, cooking wholesome, delicious meals with farmer’s market produce for New York City customers. So I had to pick one job, and I picked the job that involved more traffic. So here we are! Also for me as a vegetarian and I vegan, I am fascinated by chocolate because it is so rich and so decadent. I feel like people have this perception of veganism as very dry and depriving yourself of some things. It was very important for me to show people that you can have this very luxurious food that is completely cruelty-free. Caryn Hartglass: Now, your products are more than just cruelty-free, which is a huge mouthful to begin with, because there are so many chocolates out there that are not cruelty-free, containing dairy, primarily, which is a big bad thing. Caryn Hartglass: But you’re more than that. Your products are fair trade and organic, and very often, you include ingredients that are locally sourced. Lagusta Yearwood: Actually, as we speak, I’m smoking some shiitakes in my smoker for this chocolate that we make that’s kind of like a bacon bar – we call it a Pig Out Bar. It has smoked shiitake mushrooms and a caramel sauce and chocolate. And those are actually local shitake mushrooms. So when I started out, I figured I would be an animal rights activist. But that world was hurting my heart too much, so instead, I wanted to do something more pleasurable, so I got into the cooking world. And I think because I started out with ethics at the forefront, instead of setting out and just wanting to sell chocolate, it’s really important to us that we always use fair trade chocolate because of the human rights issues involved. And we always make organic chocolates, because starting out as an environmentalist person who is concerned with the environment and animals and things like that, it just felt like a good way to advance my principles and turn them into a business. So I’m so lucky I was able to do that. Caryn Hartglass: You’re doing a wonderful thing, because not only are you making chocolate, because most people love chocolate, but you’re sourcing it with some really excellent ingredients. And your products are beautiful! I’m on your website and everything’s gorgeous. So in addition, it’s just beautiful art. Lovely. Lagusta Yearwood: Well thank you! It’s really fun for us. We have a bunch of people working at the shop, and it’s just amazing to see. Because we’re in a college town, we have a lot of college students who work here. Actually, most of them have graduated by now. But to see these people make these beautiful products, to see them grow and create, putting their input into the products, learning cocoa butter painting and dipping truffles and all kinds of things, it’s really great to teach people how to make beautiful things. Caryn Hartglass: So there are a lot of things I’m thinking of here. I’m not quite sure how to get it all out, but let’s see what happens. There’s a lot of things going on with the food system and sustainable food and food for the poor….there’s so many different issues, and unfortunately, so many Americans today don’t know what they’re eating, don’t care what they’re eating, they just want a lot of it and they want it for cheap. Lagusta Yearwood: It’s true. I think that because our chocolate is organic and fair trade, it costs more. Sometimes it costs a lot more than a Hershey’s or a giant corporation like that. But what I’m really surprised by is – maybe because it’s I’m in New Paltz, New York, which is a very middle-class, farm-friendly town – but people seem to have literal hunger for more authentic products that cost a real cost. Especially with our chocolates, they’re so rich and intense that you don’t need a huge bar in one sitting. We have customers who come in for one truffle a day or one caramel a day, and it’s two dollars and that’s their treat for the day, then they come back tomorrow. There are ways you can find something that’s sustainable and ethical and still have a treat – and it doesn’t feel like deprivation, or like you’re paying so much for it that it isn’t worth it. Caryn Hartglass: I can’t agree more. And I really would like to see a turn in our culture. I hope it’s going that way – where we look for quality, not quantity. Where our furniture should be well made instead of particle board crap, and with the little artistry in our clothing, maybe we don’t own as many jeans, but the ones we have are made to last and made with quality ingredients and organic cotton, and the people who make them can live on the profits and send their children to school…I think it would be a more beautiful place. Lagusta Yearwood: Yeah, and maybe I’m just being the glass half-full, but I do think people are getting so fed up with our badly made jeans and houses and chocolates and everything that it’s just really refreshing when you find, for me, when I travel through another town, other little handmade shops where they’re selling their local things made by local artisans. So obviously, there’s a lot of quality issues that we have to address, not everyone has the funds to pay two dollars for a chocolate, but it feels good to be doing something to try to address some of these issues – maybe not all of them at once. Caryn Hartglass: I’m glad you’re doing it, and I imagine that it hasn’t been easy. Lagusta Yearwood: I think the good thing for us is that I never started out with any startup money or any capital. I just figured I would do it out of my house and then it got bigger, and then I rented a kitchen and it got bigger, and then we opened a shop. So I think if I had started out thinking that I wanted to make this a business with eight employees and do this and this, it would have been so overwhelming and I never would have started it. But over the past ten years, I’ve just built up really slowly. So many people think that they have a great idea for a product or something, so they jump in right away with the intent of building a huge business. But for me, I found it was better just to go with the flow and not live beyond my means, to build something up in a more sustainable way at all levels. Caryn Hartglass: Now, I just noticed on your website that you started a savory dinner series. Lagusta Yearwood: Yeah, it’s pretty amazing. Caryn Hartglass: So is that for the part of you that likes to cook everything else? Lagusta Yearwood: Exactly. We have a little back room in our shop, and we just wrapped up the series for this year because the fall gets so busy with chocolate things. But during the summertime, when there’s beautiful produce around, we do one dinner a month. Well actually, it’s four nights, 12 people a night. And it’s really amazing. I have friends who come to every one, and we try to go crazy, to make it lavish and kinda stretch our cooking skills and everything. So it’s really fun. Caryn Hartglass: I love to cook, and I love having people over for elaborate dinners where we just invent things. Lagusta Yearwood: It’s really great! Caryn Hartglass: Very good. On the subject of chocolate – where do you get your chocolate that you turn into all these beautiful confections? Lagusta Yearwood: We don’t make the chocolate from scratch, but we get it from a very nice company called TCHO in San Francisco, and they direct source everything from farmers. The lines that we get, the fair trade and organic ones, are all from Peru and Ecuador. So they work directly with the farmers and set up cooperatives; they have really good transparency about their sourcing methods and everything, so I feel really lucky that I was able to find them, because sourcing chocolate is a huge minefield of ethical issues. I’m able to talk directly with their sourcing manager, who is always going down to the farms and working with the farmers and checking everything out. It’s really inspiring what they’re doing, brining this product to the market on a pretty big scale. I mean, they’re a pretty small company, but compared to my company, they’re giant. It’s pretty great. Caryn Hartglass: I don’t think big is better, and I really encourage more small or medium size business because it’s manageable from a people standpoint. You’re talking to people that run this business, right? They know what’s going on. Lagusta Yearwood: Exactly, exactly. I know for me, I wouldn’t want to have a shop where I wasn’t there, or we had three or four branches and people came in but never saw the people who make the chocolate. For us, it’s really nice to have the connection so that if a customer asks what’s in something, the person you’re talking to made the chocolate and can tell you all about it. Caryn Hartglass: Alright, so you have a fun website, and I don’t know how you have the time to do all that you do, but you also blog. You come up with some really interesting combinations that go with chocolate. Lagusta Yearwood: I don’t know why that is, we have a lot of weird combinations. I don’t know why that is; maybe it’s because I particularly just get bored. We definitely have a line of classic truffles that are more traditional; we have peanut butter cups and peppermint patties and more wonderfully, slightly plain things. But then we just kind of go crazy, especially with whole produce, because we’re always thinking about ways to use different ingredients. A farmer friend of ours grew a lot of sorrel this year, which is like a really sour spring green. He had so much of it, he just gave me bags and bags of it. I had no idea what to do with it, so I started thinking about making a kind of a natural sour candy. It took a lot of fiddling around and a lot of working with sorrel – which, as it turns out, if you have a lot of it and you’re constantly processing it in a food processor, kind of drives everyone crazy since it’s such a strong, sharp flavor. It gets into your eyes and things; that’s something we learned. But we finally made the Sour Sorrel Caramel, and it’s really amazing. It is like a natural sour caramel. So people are going crazy over it. Caryn Hartglass: Mmm, very good. I don’t imagine you’ve done any chocolate covered ants or anything like that, have you? Lagusta Yearwood: No, we have not. Lagusta Yearwood: A lot of people said we should do something like that. But we’re strictly vegan. Caryn Hartglass: Yes, good. I was just joking. But you know, we’ve heard so many strange things about what people will put in chocolate. Caryn Hartglass: Sorrel sounds perfectly fine to me, and shiitake mushrooms, and anything else you want to put in your chocolate sounds good. Lagusta Yearwood: I need to send you a box and you can try out all of our weird flavors! Caryn Hartglass: Yes! Weird flavor box! And the other thing that’s exciting is that you have some white chocolate. That’s like next to impossible to find in the vegan world. Lagusta Yearwood: We’ve tasted almost all of the vegan white chocolates out there, and most are not exactly to my taste. They’re a little odd-tasting to my taste, because most people try to use a low-fat milk like rice milk or something and it doesn’t have that same richness. So we have found another really small company that’s working with us to make a really great white chocolate with coconut milk that doesn’t taste coconuty. It just tastes really rich and wonderful. So that is really exciting to me. Because having more milk chocolate and white chocolate without dairy is kind of the holy grail, I think. Caryn Hartglass: I’m kind of interested to hear about that, because I use a lot of coconut milk. I just made for my mom’s 80th birthday a seven-layer cake with ganache and a chocolate butter-cream filling. I loved the way it tastes, but you still know it’s coconut. And sometimes you don’t want to have coconut. Lagusta Yearwood: Were you using coconut oil too, and coconut milk? Or just the coconut milk? Caryn Hartglass: I used…I don’t know if you know this, but Let’s Do Organic has a creamed coconut. Lagusta Yearwood: Yeah, that might be why. I feel like the coconut milk, or if you use a more refined coconut oil, it doesn’t really have such a coconuty flavor, but it’s a little more refined. So it’s kind of a trade-off. But sure, it’s not like you can make vanilla ice cream with coconut milk, because it’s going to be really coconutty. But you can make a nice coconut ice cream. Caryn Hartglass: I love coconut. Lagusta Yearwood: Oh yes. I have a theory that dairy has a flavor that has just become our baseline vanilla flavor, so no one really realizes that when you taste other milks, they have a slightly different flavor. But it’s not negative; it’s just their own flavor, just like cow’s milk dairy has it’s own flavor. I think it’s just a matter of slightly shifting our taste buds sometimes. Caryn Hartglass: That’s a good point. I haven’t had dairy in almost 26 years, and I still can remember what it tastes like, and it makes me kind of sick thinking about it – but it does have a flavor, and it does impact the chocolate. Lagusta Yearwood: Exactly. I worked in a restaurant once that was vegetarian and they did very little dairy. But they once made a peach ice cream where there was one vegan version with coconut milk and one non-vegan version with cow’s milk. I tasted the wrong one and my first thought was, what is that flavor? It’s such an odd flavor? And then I tasted the vegan one, and I was just like, oh, this is peach ice cream. It’s so funny how your taste buds change so much. Caryn Hartglass: Well, we can learn to eat anything – and like just about anything. It’s a scary thing. Now, you’ve been vegan for a long time, right? Lagusta Yearwood: I guess about 16 years or so. So yeah – 16! Caryn Hartglass: Is this something you did on your own, or did your parents encourage you? What happened? Lagusta Yearwood: I guess I became vegetarian when I was around 12. It’s funny, I have a lot of friends who became vegetarian when they were around 12. I want to conduct a study or something about this phenomenon. Caryn Hartglass: I was 15. Lagusta Yearwood: And then I slowly got more and more into animal rights, just thinking about where animal products come from and things like that. When I was 15 I became vegan and went to several animal rights meetings, and everyone there was vegan, so I figured it was probably possibly. My mom actually became vegan with me, and she’s still vegan, so it’s really wonderful. Caryn Hartglass: That’s very wonderful. I like that. Well – here’s what I’m putting out to the universe, and I hope that people with their business want to not just focus on making a big profit but on making a quality product that does something good for the world and doesn’t do anything bad. Lagusta Yearwood: Absolutely. Let’s hope! Lagusta Yearwood: It doesn’t sound like so much to ask for. Caryn Hartglass: I love the vegan community because most of them really care: about people, about animals, about the planet…they care about so many different things, and when I read the newspaper, which I do only on the weekends, it blows me away. How can people be so heartless? How can people be so cruel? Lagusta Yearwood: I think it’s very easy just to close your eyes to the reality of the world. I feel that way a lot when I think about things. There’s all these ingrained systems that are conspiring to prevent you from thinking about what really happened. But yes, it does get pretty discouraging sometimes. Caryn Hartglass: Okay, so I’m back on your website again, and I’m noticing that there are some products on here that I think are from other people? Lagusta Yearwood: Yeah, other products. My best friend Marissa who does all of our photoshopping spent a year developing a recipe for these French macaroons that are totally different from macaroons. They’re beautiful delicate cookies with almond flour – and yes, she’s amazing. She’s going for it. Caryn Hartglass: They’re beautiful. And they’re gluten-free. Lagusta Yearwood: She’s actually making a batch right now. I can smell it through the walls from sitting outside. Caryn Hartglass: I’m looking at them, and they are really, really lovely. So I look forward to biting into one of them one day. I’m excited about all kind of vegan foods, so I’m just going to ask – what’s this treeline cashew cheese? Lagusta Yearwood: Oh yeah! It’s a really wonderful cheese. It’s in so many stores now, but it actually started out being made in the back room of our shop. Both of our businesses, a friend of mine who owns a cheese business, were growing so much that we realized we needed all the space, and that was where he made the cashew cheese. It’s really great, the cashew cheese. It comes in two varieties: one is the cream cheese, which coms in a couple different flavors, and then the hard cheese, which is so amazing. It’s just clean tasting and has a really nice sharp, cheesy flavor. So the world of vegan cheeses just keeps getting better and better..
Caryn Hartglass: Yay! That’s so wonderful! And you’re a delicious part of that, so thank you, Lagusta. Caryn Hartglass: Well, I’ll definitely have to try all these products sometimes soon. I’m going to have to go and get some chocolate now. So thank you for joining me, and all the best with your delicious products. Thank you for making the world a yummy place. Lagusta Yearwood: Well thank you! Thank you for this wonderful show! Caryn Hartglass: Okay! You take care! Caryn Hartglass: Okay, so just a minute or two here – when you’re looking for vegan chocolate, go to Lagusta Yearwood; you can find her online at lagustasluscious.com. Just look at the pictures. They are so, so beautiful. Now, you know me. I always like to talk about treats. Treats are things that you don’t have every day. They’re something special, something you don’t have every day, and they should be made with high quality ingredients so they really feel like a celebration. That’s what these foods are, and I wish there were a whole lot more of them. I just want to let you know that next week is going to be spectacular. I’m so excited about my guest, David Simon, who has a new book out called MEATONOMIC$. You have to listen to this. It’s going to be an awesome half hour. He has done so much work, about the animal food industry and how, through all kinds of hidden costs, they have burdened us with over 400 billion dollars. I can’t wait to hear from him. And then the second part of the show – Bhava Ram is going to be talking about his book, Warrior Pose, and I loved reading this book. Towards the end, I didn’t even know there was going to be some food references. I was so happy when I read that because I always like to tie the food issues into what we’re talking about. But anyhow, he had a broken pack, a failed surgery, he was running around as a network news-work correspondent, and then he had stage 4 cancer and managed to heal himself and find peace. It’s really inspiring story and I can’t wait to talk to him. So join me, please – next week, September 3rd. For now, join me on responsibleeatingandliving.com and the swingingourmets.com website where you can see our latest video. So you’ve got a lot to do! This is Caryn Hartglass, and this has been It’s All About Food! Have a delicious week!